In our thirty-two years of studying the intersection of sport and marketing, we have seen a fair share of demoralizing stories: the bribery scandal of the Salt Lake City Olympics, money laundering by FIFA, racism with the L.A. Clippers, and performance enhancement drugs across professional cycling, Major League Baseball, and even the entire Russian Olympic Team — the list is long and broad. But for sponsors wishing to capitalize on the positive aspects of sports, there is no playbook for what to do when great partnerships take an ugly turn. Sometimes the path is straight forward—Just get up and go. Sponsors such as Accenture and Gillette who fled from Tiger Woods, or Nike and InBev who separated from Lance Armstrong, made strong statements and were not hurting anyone (except the tarnished athlete) by walking away. Moreover, they probably put the money toward better purposes while taking a stand on morality issues. These sponsors were unhitching themselves from damaged personalities with the sport, not the sport itself. Sometimes the response is Full speed ahead. Following the MLB steroid scandal of 2005, the New York Times reported that none of the then-current sponsors left baseball, and in fact seven new sponsors signed on for the next season. Two of those companies, GM and DHL, made public statements that they felt confident in the new direction MLB was taking regarding steroid use. But sometimes the most impactful answer is Tough love. It seems like the public agrees with this tough love response. In a survey of 1,000 respondents completed January 29-30 by Performance Research, the majority a (61%) agreed that the position they would most want a corporate sponsor of USA Gymnastics to take is, “Maintain the sponsorship only if USA Gymnastics makes significant changes to safeguard young gymnasts”. In signing with USA Gymnastics, AT&T’s executive director of corporate sponsorships stated, “We want properties where we can help each other. That’s a true partnership.”  In this regard, we applaud AT&T’s decision to stand with the athletes and be a powerful influence on positive changes in the sport. USA Gymnastics’ motto is, “Begin here. 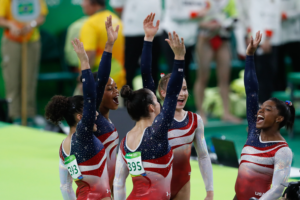 Go anywhere.” USA Gymnastics will be starting from scratch, and they will have a long way to go. It is a great sport with courageous athletes- and we hope they get there. Sponsor dropped by spokesperson after insensitive tweet, now that’s a switch! NASCAR’s Reed Sorenson’s Toyota carrying Trump / Pence paint scheme this weekend. Good or Bad for Associate Sponsors?